Looking for Package Deals to Boca Raton Resort? We have those too! Boca Raton, familiarly known to locals by its first name "Boca", truly has it all. Whether you're visiting Boca Raton, Florida for business or recreation, make a round of golf one of your top priorities. 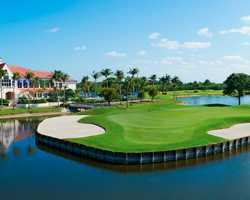 Boca Raton, Florida has many outstanding options for the avid golfer, including a wide variety of courses and plenty of tee times to fit your schedule. This course must be booked as part of a "Stay & Play" package at Boca Raton Resort. The Country Club Course, just a short shuttle ride from Boca Raton Resort and Boca Beach Club, also offers an exclusive golf experience and a wonderful opportunity to receive professional instruction at the Dave Pelz Scoring Game School. 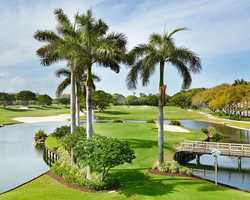 Enjoy a visually stunning round of golf with an 18th-hole island green, a fully stocked pro shop, superb practice facilities and beautifully maintained links at this exclusive Country Club Course at Boca Raton Resort & Club. This course must be booked as part of a "Stay & Play" package at Boca Raton Resort. The Resort Course was built in 1926 and enjoys world fame and acknowledgement as one of Florida’s golden age courses. Discover the rich historic value and tradition of this exquisite golf course, dating back to when PGA professionals Sam Snead and Tommy Armour served at the resort. This distinctive Resort Course with a signature water feature designed by Hugh Hughes promises to provide a truly exclusive golf experience.